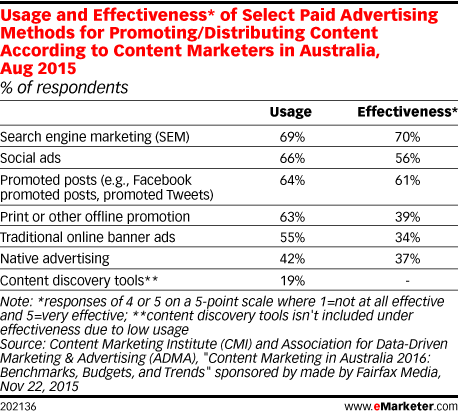 Data is from the November 2015 Content Marketing Institute (CMI) and Association for Data-Driven Marketing & Advertising (ADMA) report titled "Content Marketing in Australia 2016: Benchmarks, Budgets, and Trends" sponsored by made by Fairfax Media. 146 marketers in Australia were surveyed during July-August 2015. 78 were from B2B companies, 21 were from B2C companies and 47 were from both B2B and B2C companies. The survey was emailed to marketers from CMI, Association for ADMA, MarketingProfs, Business Marketing Association (BMA), Blackbaud, Industry Week, New Equipment Digest and WTWH Media.